This lovely tangle pattern, Rouche, is from new tangler Rose Brown and it’s her first on the site. In this example you can see that Rouche looks equally interesting from a different angle. It’s a very versatile tangle and I really enjoyed drawing it, especially the swirly ribbon bits. Rouche would make a great monotangle with all its possibilities for shading and fills. 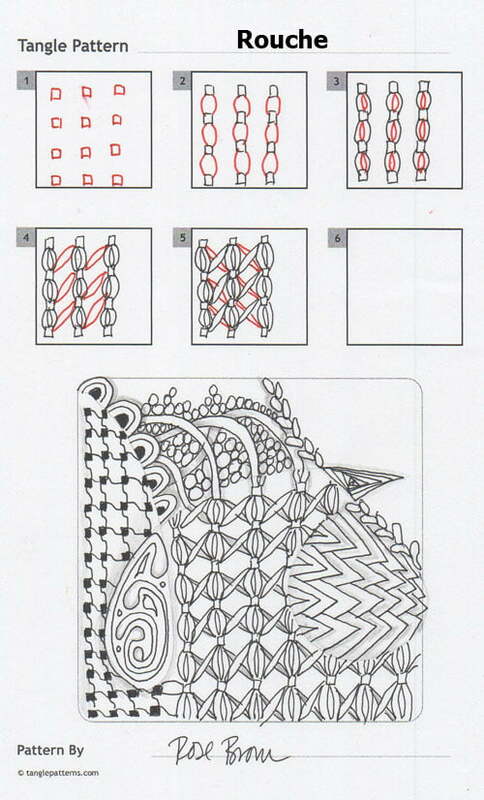 Here are Rose’s step-by-step instructions for drawing Rouche and her Zentangle featuring her tangle. Thanks for sharing a great tangle with us, Rose. Check out the tag roseb for more of Rose’s patterns on TanglePatterns.com. Love this one, thanks for sharing, can’t wait to give it a go. This is lovely, Rose. A true Zentangle pattern….thoughtful, yet repetitive… No graph paper, rulers or trigonometry required :-)… BRAVA! And Thank You! Super good tangle, Rose. Thank you for the tangle & the great example, too. This is a fun one to do, very nice! Thank you for this pattern. I have tried it following your great diagrams and found it easy. I’d like to thank Rose for a lovely pattern and instructions that make it so easy to understand.At first glance I was a bit worried I’d get lost in the details but you walked me thrown this in a quick and easy way. I’ve always had a problem will a reading disablity and I sometimes get a little lost with some of the patterns at first but this was a joy to learn. Thanks again Rose! Thank Linda for putting all these great patterns and insturctions all in one place! What a gorgeous pattern! I just tried it and I love it… Instead of drawing the last strokes behind the first (diagonal ones), I just overlapped them. Really fun to draw, and it looks much more difficult than it was. Thanks for sharing!